In episode eighteen of Inside Melbourne, Caty Price and Clint Stanaway are joined by a legend of the industry in Mike Sheahan to discuss all things Melbourne. We ask where Max Gawn would sit in his top 50 (6:00), discover Mike’s favourite Melbourne player (8:00) and take all your questions from the outer (10:00). Special guest Charlie Spargo joins the team and discovers an interesting connection between his family and Mike (22:00) and we get Charlie’s thoughts on the weight of wearing the number nine (26:00). THE No.9 guernsey holds a special place in Melbourne’s history. Among its wearers are five-time premiership player Brian Dixon, three-time best and fairest winner Laurie Fowler, dual Keith ‘Bluey’ Truscott Memorial Trophy winner Alan Johnson and former co-captain Jack Trengove. But it was the great David Neitz, who wore it in 286 of his 306 games, that had some advice for its latest inheritor. “After talking to ‘Neita’, he said ‘make the number your own’,” Charlie Spargo told the Inside Melbourne podcast. “He’s a really good bloke - he said don’t put any pressure on yourself. Taken at pick No.29 in last year’s NAB AFL Draft, Spargo has provided plenty of spark for the red and blue in his debut season. 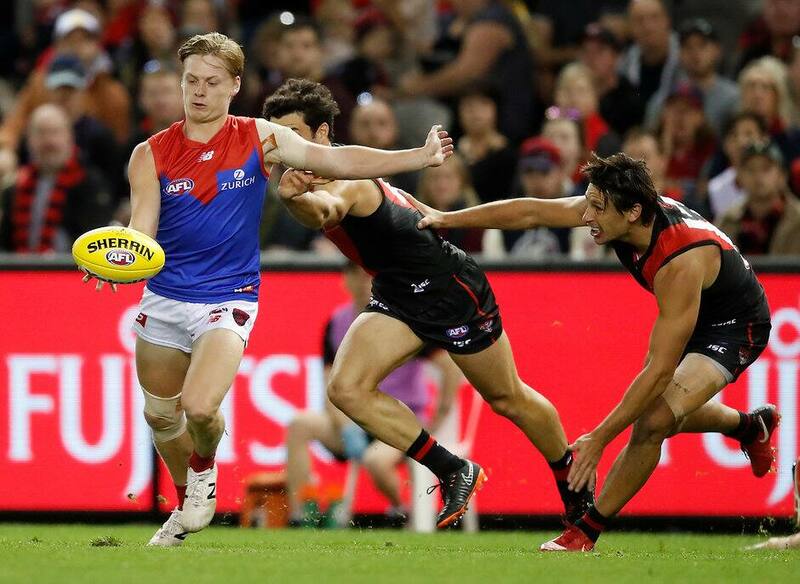 Since playing his first game in round six against Essendon, the small forward has totalled nine matches and is averaging 13.1 disposals at 80% efficiency. But with a long family history – great-grandfather, Bob snr, grandfather, Bob jnr, and father, Paul, all played AFL – Spargo said it was a tough decision in deciding which number to wear on his back. “I got the choice between No.9 and No.31, which is obviously Ron Barassi,” Spargo said. Spargo’s choice left the historic alternative to fellow draftee, Bayley Fritsch. Since arriving at the club together, the two have settled in well, both on and off the field. “We do hang out a lot,” Spargo admitted.